Welcome to our Wholesale Auction! This Website is not for public use, but is designed exclusively for Registered Car Dealers, Fleet/Lease Companies, and Lending Institutions with repossessions. We belong to all the appropriate national auction organizations validating our unique ability to move your vehicles; NAAA, PIADA and NYIADA to name a few. We have the vehicles you`re looking for and our complete range of wholesale auction services also enable us to provide for your standard and special needs, making us your wholesale auction of choice. It`s all here! Look around our site. If you don`t see what you need, have any suggestions or comments, please call, fax, e-mail or come by. Sale night is every Tuesday evening at 5:30 PM. We`ll take good care of you! TO VIEW UPCOMING SALE INVENTORY -ENTER YOUR USERNAME & PASSWORD IN THE USER LOGIN ABOVE OR CLICK SIGN UP NOW. Consignments from the top Dealers around! 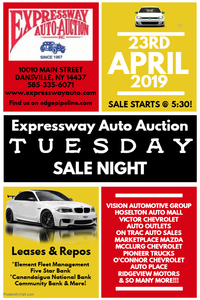 VISION AUTOMOTIVE GROUP, HOSELTON AUTO MALL, ON TRAC AUTO SALES, MARKETPLACE MAZDA, O'CONNOR CHEVROLET, AUTO PLACE, AUTO OUTLETS, PIONEER TRUCKS, MARINA DODGE, ATLAS AUTO, GRISBYS AUTO SALES, BERGEN SALES, ELEMENT FLEET MANAGEMENT, COMMUNITY BANK & SO MANY MORE! NEED HELP FINANCING YOUR CARS? CLICK HERE TO SEE ALL OF THE FLOOR PLAN COMPANIES WE CURRENTLY WORK WITH.